Best Food Writing 2008 once more authoritatively and appealingly assembles the finest culinary prose from the past year’s books, magazines, newspapers, newsletters, and Web sites. This anthology features both established food writers and rising stars addressing everything from celebrated chefs to the travails of the home cook, and from erudite culinary history to food-inspired memoirs. By turns opinionated, evocative, nostalgic, sensuous, and just plain funny, it’s a tasty sampler to dip into time and again, whether you’re in the mood for foie gras or fruitcake. 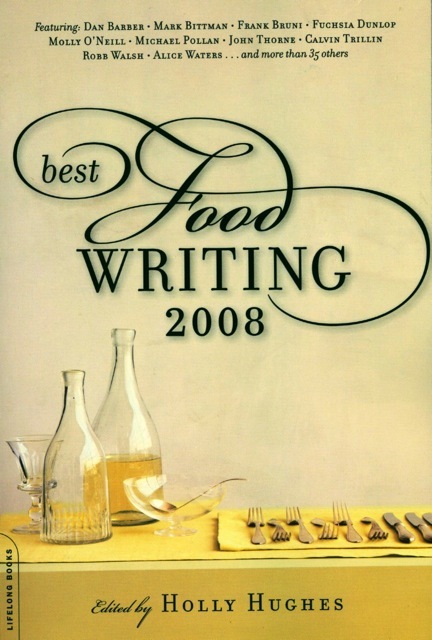 Like previous collections, Best Food Writing 2008 will include writers such as Colman Andrews, Anthony Bourdain, Frank Bruni, Bill Buford, Barbara Kingsolver, Madhur Jaffrey, Ruth Reichl, Raymond Sokolov, Jeffrey Steingarten, and many others. Culinate is proud to be included in the 2008 collection with Sona Pai's "Mangoes, memories  —  and motorcycles."